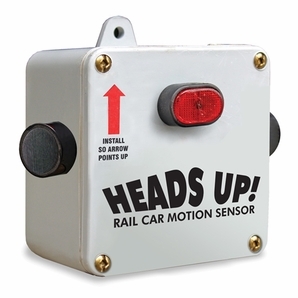 'HEADS UP' Railcar Motion Detector. Attaches magnetically to the bearing cap of a freight car wheel. Should the wheel turn more than 19 degrees, the battery-powered twin sirens emit 90 db two-tone warning that the rail car is moving. Turn detector so red arrow is vertical. Then arm the sensor by pushing red rocker switch. To silence sirens, push the switch again.